If you know us at all–you’ll know that we–as a family–just aren’t into the noisy, flashy, spinny toys that seem to be all the thing these days. I swear, some of them seem kind of…possessed…ummm…I mean, a bit over the top. 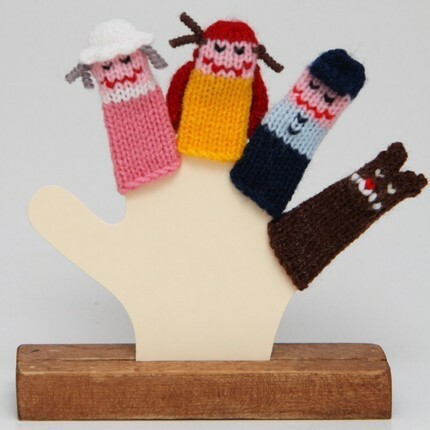 Which is why I love, love, LOVE these sweet little finger puppets from Wee Knit. No, this is not a paid endorsement, I just really love them. Years ago, I bought a little Gingerbread Man at Mormon Handicraft in Salt Lake City. He was so sweet and tiny and adorable that I couldn’t help myself. I soon found that he fit very nicely on top of a knitting needle that was poking out of my pencil cup. He has lived there ever since. 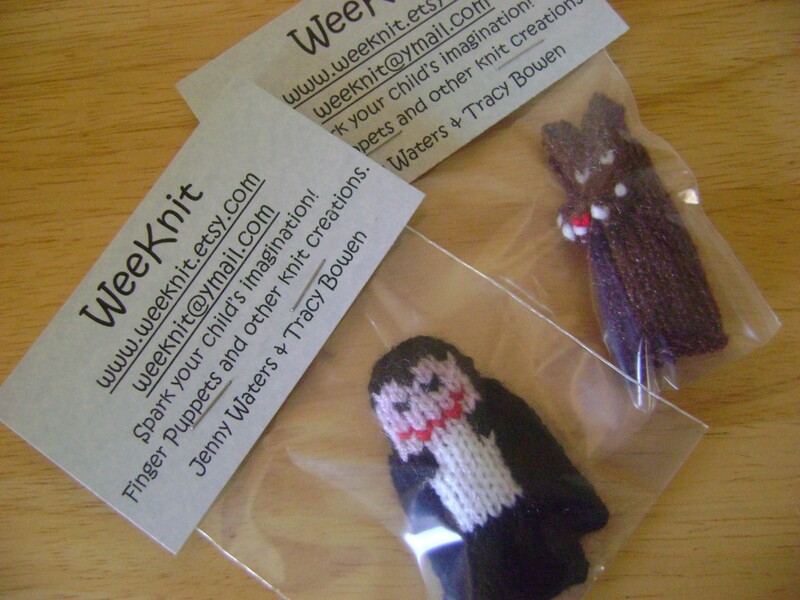 So then one day, I’m dinking around on Etsy (the online shop for all things Handmade) and I found the WeeKnit shop–where my little cookie man came from! Wahooo! I contacted them to see if they could conjure up an Edward and Jacob finger puppet for our New Moon party. Jennifer was wonderful with my silly special order. As you can see–they did an incredible job!! You need to visit the shop–seriously. These gals–Tracy and Jennifer, a mom and daughter–have thought of everything. Movies, TV shows, Story books. You need animals? Circus clowns? Ninja Turtles? They even have a Valentine set—and it’s on SALE! 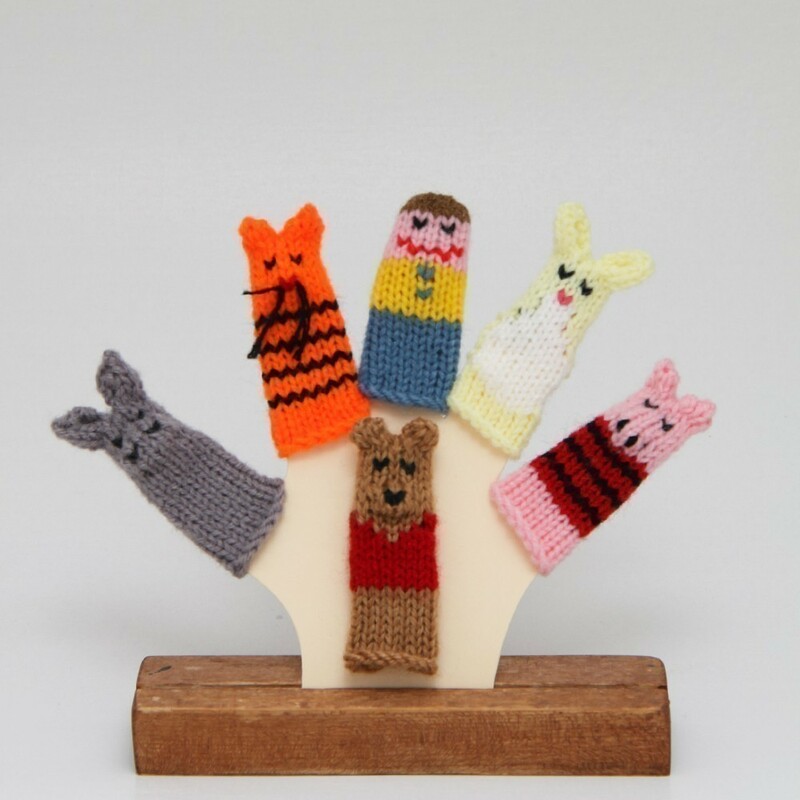 Now–since it’s been such a long, long time since we’ve had a giveaway AND because, again, I can’t help myself–we are giving one lucky reader this adorable “Little Red Riding Hood” Finger Puppet Set–from WeeKnit. To enter, simply go to the WeeKnit site and tell me in the comment section below, which set is your very favorite. Oh, and it has to be one that I haven’t show here. I’ll announce the winner Monday morning January 25, 2010–first thing. You’re right, they are dang cute! I love the round Easter Egglets and the Santa and reindeer. I also adore Goldilocks and the 3 Bears because that’s Micaela’s favorite story right now. We love the Space Wars set. John even loves them! What cute little things! I love the Five Little Monkeys! I have a couple fingerplays/songs that those would go wonderfully with those! I love that you can find such simple fun toys. I have been trying to get more classics and less jazzy toys–they last longer! Goldilocks–don’t you just love her hair? Oh, my gosh. So cute. Yoda and Darth! They kill me—I laughed my head off! Did you see the 5 Little Speckled Frogs? I have no idea how to keep myself from buying them all. My babies will love them! I’m SOOO glad you found these because they are SOOO sooo SOOO cute and fun!!! I’m in LOVE with the Ninja Turtles and Pirates, but you already knew that! 😉 EVERYone probably already knew that!!! HA ha ha!!! The zoo animals are super cute and ANYone would have fun playing with them! 🙂 I LOVE this shop!!! I like the Wizard of Oz one. So cute. I love the witch frowning! The nativity is darling too. I think a Noahs ark one would be awesome…but I didn’t see one there. Old Noah is on the 3rd page. It’s adorable too. Your mom needs the Wizard of Oz–don’t you think? The Princesses are pretty cute–and I don’t even LIKE the whole princess thing. They are adorable! I love the 5 green and speckled frogs. They would just be so cute to go with that song. But also, I’m a violin teacher so they probably fit perfectly on the tops of students bows. I just want all of them 🙂 I could see a million ways to use them in my violin studio. I’m just going to have to get myself some! Oh, man–you are sooo right! I used to stick a tiny little ninja man on the scroll of my son’s violin so he’d look in the right direction. Wouldn’t these guys be sweet sitting up there? So many cute ones! I think the nativity and the woodland creatures are my favorites. Probably the Spiderman set, cause I actually ordered them before. HAHAHA! Next would be Space Wars! I love all of WeeKnit’s puppets, but I think I would really like to get the Community Helpers set for my pastor’s wife for her Toddler Time with Jesus class. These are super cute. I saw someone with Nativity finger puppets around Christmas time and I wanted some for my little guy. My husband is a huge Star Wars fan, so I love the Space Wars ones. Also really like the 5 little monkeys. Adorable. I love love love the nativity set and the Wizard of Oz!!! They are all so cute, though! Its really hard to choose a fav but if I have to for now the set of 5 pirate fun puppets will be my choice. Oh, yeah! There are zoo guys in the zoo animals set–on the first page. 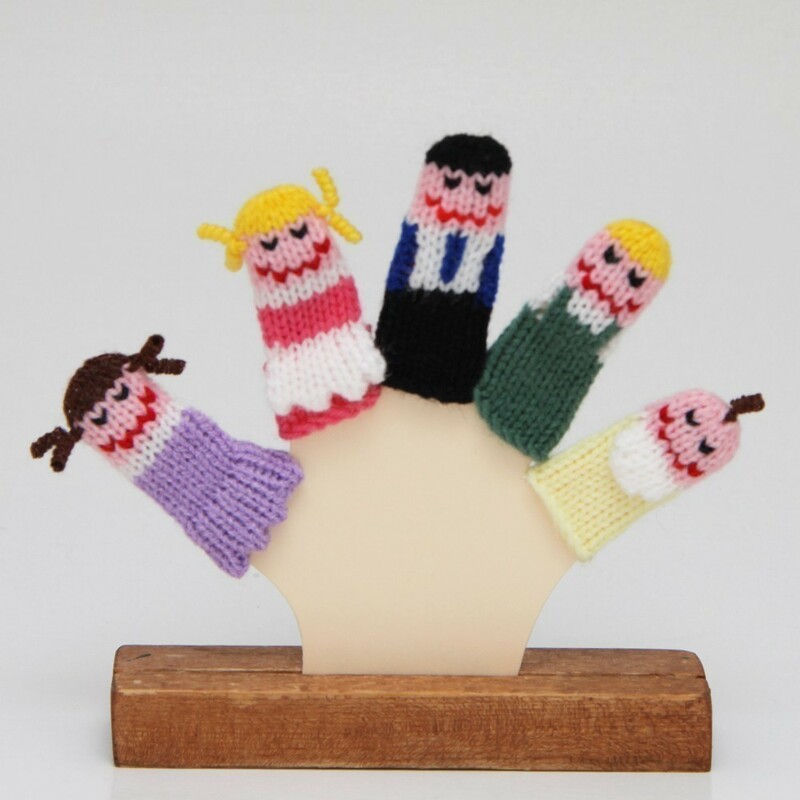 Oh how cute…what a great idea for little creative minds to play with for ‘quite times’. I love the yo gabba gabba monsters. They look perfect. Five little monkeys will always be my favorite… We LOVE WeeKnit!!! Oh My GOSH!!! These are adorable. picking a favorite is hard, and I almost bought the Wizard of oz one as soon as I saw it!! But I do have to think about what my husband would say… in some ways, you are so lucky! That one is probably my favorite considering I collect Wizard of Oz stuff. But I also really like every one of the story ones like the three pigs, and Goldilocks, and the Gingerbread man!! These would be perfect to use in my classroom!! I also love the 5 speckled frogs because I sing that song as a transition in my classroom and that would be awesome to have those and get the kids more involved!! I could go broke on this one sight getting everything I want for my classroom, and of course my future kiddos!! Because I have 3 little grandsons that love to go to the zoo my pick would have to be the zoo animals with the friendly monsters a close second. These would keep little fingers busy for a long time I bet. The three little pigs set are the best. How cute they are with their little snouts. Precious! 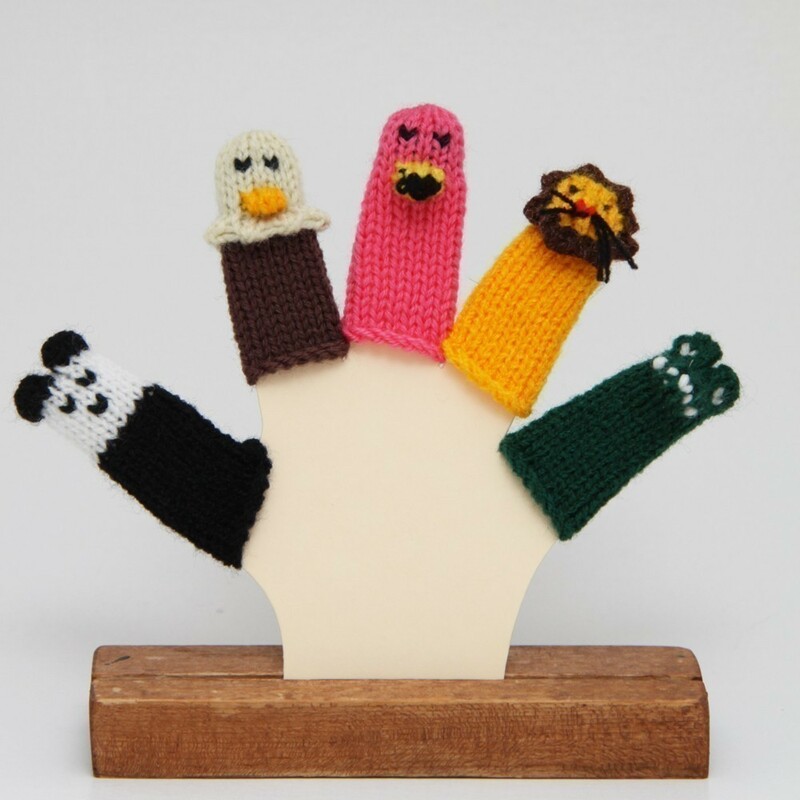 My six year old loves the fairy tale stories and these would be great as finger puppets during story time with him. 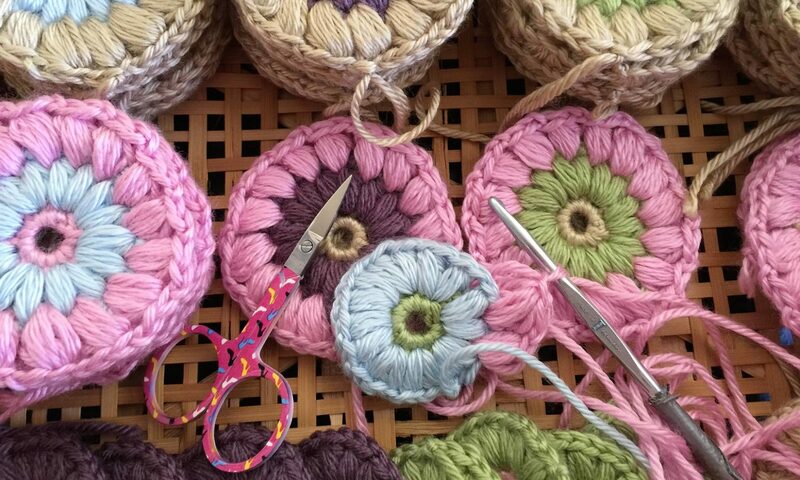 Thanks for sharing Wee Knit with us.